This week’s article is about a singer who took the dancemusic-scene by storm as her first hit topped all major charts when it first was released in 2001. Since then, she’s worked with most major players in the house- and trance-scene like Armin Van Buuren, Schiller, BT and John Creamer & Stephane K just to name a few. I remember when Rapture first was released. All my music-friends talked about it, Armin hyped it, especially his own remix but I still prefer the Riva Remix over Armin, Deep Dish, Creamer & Ks versions. 01:12 when the full music starts. 01:55 when the break starts. 02:10 when the vocals starts. 03:35 when the second verse starts. 05:01 when the second verse starts. Libyan born Paikstani, Nadia Ali emigrated to Queens, New York at the age of 4 and started singing at the age of 8 but it was first in the late teens that she got her recognition as a singer. She started working at Versace’s New York-office at the age of 17 and it was at one of their christmas parties that she performed and first got attention. One of her collegues at Versace introduced her to producer Markus Moser who originally was looking for a singer who could write tracks for a German girl-group. Their collaboration instead ended up with their own material under the name iiO. They first decided on the name Vaiio after the Sony-computer that Nadia wroter her lyrics on but later changed the name to iiO. The first track Nadia wrote, Rapture was written in 30 minutes and was based on an encounter with an Australian nightclub owner. Their first demo was first played at the New York-club Twilo and was later hyped by Pete Tong who played the demo-version on his Radio 1-show. The track really hit it off when big names as Sasha, Danny Tenaglia and Sander Kleinenberg started hammering it at the Ibiza clubs the same summer and with the release of the single on Ministry Of Sounds label the following autumn, the big success came. The track peaked at no 2 in the UK Singles Chart and hit the same position on the Billboard Dance Hot Club Play Chart in the US. Rapture has since it’s original release been licensed to various record labels and been re-released several times over the years. 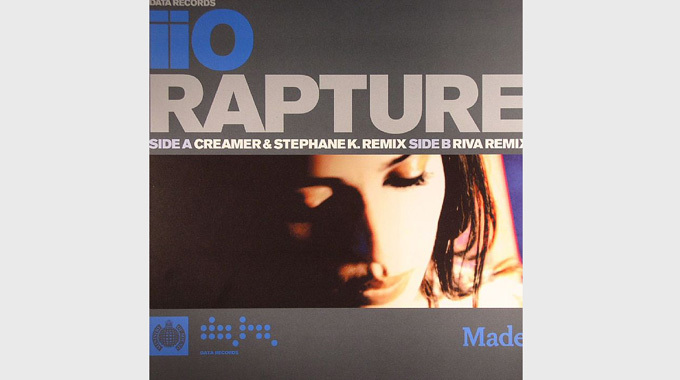 Since Rapture came out, iiO was on tour most of the time. IiO’s next single, the 2002 track At The End did fairly well and peaked at no 13 in the Finnish chart an no 16 in the Danish chart. It came with a pretty good remix-package with reworks by The Scumfrog, Johnny Vicious, JCA, Saeed & Palash just to name a few. Out of the lot, I prefer the Scumfrog-remix. The followup-single, the 2002 release of Smooth peaked at no 2 in the Finish chart and was released with 2 radio versions. The original, slow radioversion and the more uplifting Airbase radioversion. Of the two, I prefer the Airbase one. Again, the single came with a pretty good remixes from Airbase, Steve Porter and Pig & Dan just to name a few. The 2004 single, Runaway did well in Finland again where it peaked at no 2, and was released on CD-maxi with 7 versions or 3×12” with the same versions. I prefer the Ford Remix and the Austin Leeds vs Sinesweeper Remix over the Original Serenity Mix which is ballad-ish. After the release of the 2005 single, Kiss You, Nadia Ali left the duo. Markus Moser finally got the long postponed debut album, Poetica, released the same year. The track peaked at no 3 in the US Billboard Hot Dance Club Play Chart and at no 5 in the Finnish chart. Markus Moser kept releasing some tracks under the iiO-moniker and their biggest US hit came with the 2006-single, Is It Love?, which peaked at no 1 in the Billboard Hot Dance Club Play Chart. There was even a second album, the 2011 release, Exit 110 which still uses Nadia on song although she hasn’t recorded with Markus Moser since 2005. The last single from the iiO-moniker came in 2011 with It’ll Be Like. When it comes to Nadia Ali’s solo career, she has had alot of success. Her first single, a collaboration with the almighty Armin Van Buuren featuring Nadia Ali – Who Is Watching is the most meaningful texts she’s ever written. It’s about ”one’s struggle to reach the top, only to realise once one is there how lonely it is and how one has forgotten their priorities and the important people in their life”. The track peaked at no 19 in the Finnish chart. Her first own release, Crash & Burn peaked at no 6 in the US Hot Dance Club Play Chart and came with an impressive remix-package from DJ’s like Roger Shah, Dean Coleman and Sultan & Ned Shepard Remix. Love Story, the second solo-release topped the Billboard Hot Dance Club Play Chart and was even nominated for the Best Progressive/House Track at the 2010 International Dance Music Awards at the Winter Music Conference in Miami. Nadia was featured on the MTV program Iggy in 2009 where she performed acoustic versions of Rapture, Crash & Burn and Love Story. Nadias 2009 debut solo album, Embers contained all 3 recent singles plus another 10 tracks including the 2010 single, Fantasy which actually was voted as the fourth single by her Facebook-fans. The Morgan Page remix of Fantasy was nominated for Best Remixed Recording at the 53rd Grammy Awards and was also chosen as the video version. There was also an alternative video with the album version. The album title, Embers was chosen because ”most of the songs that I wrote were about relationships that I’ve experienced and how they leave like tiny embers inside me still”. Embers was also released on Nadia Ali’s own label, Smile In Bed along with all the singles from the album. There was also 3 remix-albums released, Queen Of Clubs Trilogy: Diamond Edition, Ruby Edition and Onyx Edition. Where the Diamond Edition contains extended versions, the Ruby Edition contains remixes and the Onyx Edition contains tracks that features other artists and Nadia on song. Since Embers, Nadia has been working on her second studio album with the working title ”Phoenix” for which she took 40 days off in February 2012. She even moved from New York to Los Angeles after living there for 26 years just to get inspired for the new album. The only own release we’ve seen so far is the Youtube-video, When It Rains and the EDX-single This Is Your Life with Nadia on vocals.She’ll also sing on the upcoming track from BT, Must Be The Love. Nadia Ali’s unique singing has always made me curious. Her original material is really great but the remixes takes her tracks to a whole new level. I hope she’ll finish her second solo album soon as her future still looks really bright. If the new album fails, she’s still some true classics in her luggage to keep her touring for several more years. Hope to see her on the road nearby soon!